Engineering co-op Faculty of the Year award recipient professor Mina Hoorfar in the research lab. The School of Engineering at UBC’s Okanagan campus is celebrating the success of this year's engineering co-op graduates -- students who have combined classroom learning with practical work experience -- as part of National Cooperative Educational Week (Mar. 21 to 25). At the school’s recent Co-op Graduation Reception, awards were given to the top co-op faculty member, student and employer of the year. UBC mechanical engineering professor Mina Hoorfar received the Co-op Faculty of the Year award for her ongoing commitment to the co-op program and her record of assisting students in their research aspirations through regular mentoring and coaching. "Dr. Hoorfar works hard to design projects that provide students practical and real-world related work experiences in engineering along with exposure to publishing and presenting papers in peer-reviewed journals and conferences," says Bushra Waheed, Engineering Co-op Coordinator. 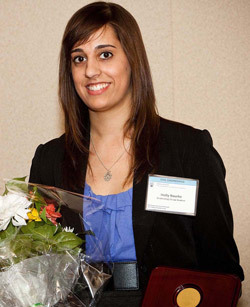 School of Engineering Co-op Student of the Year award-winner Holly Rourke. Student of the Year award was presented to Holly Rourke, a civil engineering co-op student who is on track to graduate this spring, while the award for Employer of the Year was given to one of North America's largest construction and mining companies, Kiewit, for its outstanding support of the UBC engineering co-op program. "Civil engineering is a broad field, and before embarking on my first term I wasn't sure where I wanted to specialize," says Rourke. "I definitely feel co-op has given me a leg-up. Not only do you get to see how classroom concepts are applied to real-life problems, but co-op salaries are also a huge help with tuition." In the 2010/2011academic year nearly 100 work terms were filled by civil, electrical and mechanical engineering co-op students from UBC's Okanagan campus. About 57 per cent of these work placements were in the Okanagan and various other regions of B.C., while 21 percent took place in the Lower Mainland. An additional 20 percent of students found co-op opportunities across Canada, while one per cent gained international experience in Australia. In June, 25 engineering co-op students from UBC's Okanagan campus are expected to graduate with co-op standing.